romance. Taking advantage of her background in ancient cultures, she writes in periods extending from ancient Egypt to the Victorian period. She has a doctoral degree in anthropology with a specialty in the subdiscipline of archaeology from the University of Texas at Austin. She has done field work in both the Middle East and the United States, as well as museum research and work in exhibits of ancient art. Her first novel, Heart of the Falcon, a historical romance set in ancient Egypt, was published in 1990 by Bantam Books and was republished in 1997. Her first mystery was published by Walker & Company in 1994. Set in ancient Egypt, Murder in the Place of Anubis received rave reviews from Publishers Weekly, Kirkus Reviews, Bookline, and Mystery News, to name a few. The next books in the Lord Meren series, Murder at the God's Gate (Walker, 1995), Murder at the Feast of Rejoicing (Walker, 1996), and Eater of Souls (Walker, 1997) also received rave reviews from major reviewers, including the New York Times Book Review. She then signed with Mysterious Press/Warner Books to do the fifth and latest Lord Meren book, Drinker of Blood (Mysterious Press, 1998), which has just been released in hardcover. Her mysteries have won the acclaim of Egyptologists for their accuracy and authentic portrayal of life in ancient Egypt, but it is the fascinating storylines and complex character which make her work really stand out in the historical fiction genre. Robinson is also the author of ten historical romance novels for Bantam Books. Among these are Lady Gallant, Lady Dangerous, Lord of the Dragon and The Engagement. Both a popular and critical success in this field, Robinson publishes these novels under her middle name, Suzanne. Praised for her complex, intriguing plots, unique characterization and historical authenticity, she has recently signed a contract with Bantam for several more books. Born in Texas, she lives there in the south central hill country with her husband. Lynda spoke with us about how she got her start as both a mystery novelist and romance author, and her latest book, Drinker of Blood (Mysterious Press, Nov., 1998) which continues Lord Meren's (the "Eyes and Ears of the Pharoah") investigations into the death of Queen Nefertiti. What influenced you to leave the halls of academia for the life of a novelist? I was doing my dissertation, and as I struggled through it, I realized I couldn't live my life in academia. I had burnt out on it, and I simply didn't like the politics of university life. My husband had seen an article on how much writers make (obviously not based on fact), and he suggested I try writing. I thought he was nuts. Writers were people like Truman Capote and Shakespeare, not me. However, my husband kept pestering me; he's good at that. Finally I decided to try making up a story. I sat down at my computer, wrote five pages of a manuscript and realized that's what I wanted to do for the rest of my life. It is from this experience that I know the true meaning of the word revelation. I understand that while pursuing your doctorate you did some field work, including some in the Middle East. Tell us about a typical day out in the field. I haven't done that much field work because I went from graduate school into writing, however... A day digging in the field differs between America and the Middle East. In America students do the backbreaking work with shovels and wheelbarrows. In the Middle East, that kind of labor is done by people hired from the locality in which you're digging while the archaeologist supervises, takes notes, etc. A typical day of digging at a large site in the Middle East has several components. There's the actual digging according to a set plan within a grid laid out prior to excavation so that any artifact found can be located in 3 dimensions and in relation to each other. There's recording of what is found, which includes not just artifacts but such things as pollen and plant samples from the soil. Today archaeology is a truly interdisciplinary pursuit with paleontologists, geologists, physical anthropologists, etc. all contributing to build a complete picture of a site. Anyway, you get up before dawn, eat breakfast and get out to the tel (the mound) and dig until the heat gets really bad. Then you go back to the village, wash, eat, and spend some time on the day's notes and in analyzing stuff you already dug up. Hard work even if somebody else is doing the heavy lifting. Did you enjoy field work? Yes, I did, but one can't be in the field all the time. Early state formation in the ancient Middle East, which means predynastic cultures, the rise of social stratification as indicated by complexity of grave goods. How did you come up with the idea for the Lord Meren mystery series? When I first started writing I quickly realized I'd have to concentrate on historical writing because that's what interested me. Ancient Egypt was my first love, the period about which I read the most. However, Bantam Books, my historical romance publisher, was reluctant to let me leave my successful Tudor, medieval and Victorian time periods, so I looked around for another avenue. One day I found it in a book store mystery section. I love mysteries, and I was looking at one set in the Victorian period. Next I saw one set in the Elizabethan period, and one in Roman times. That's when the idea clicked-if people can read about the Romans in mysteries, they can go back a few thousand years earlier and read about ancient Egyptian mysteries! The Lord Meren series seems like an especially difficult series to write because of the time period in which it was set. It's not difficult for someone with my background. I think writing a contemporary mystery and dealing with all that technical and scientific stuff would be harder for me. How much detail do scholars really have about the day to day life of the Egyptians? A lot more than almost any other ancient culture. Remember, the Egyptians were a literate culture and left lots of records, and their tomb paintings give minute details about everyday activities such as beer making, harvesting, etc. Then, of course, there's the archaeology, which has been going on for well over a hundred years. I'd like to talk about Lord Meren's latest adventure, which was just released, Drinker of Blood. Drinker of Blood continues Lord Meren's search for the murderer of Queen Nefertiti he began in the last book, Eater of Souls. Was the real Queen Nefertiti really murdered ? What do we really know about what happened? No. We don't know what really happened. And if she was murdered, were not likely to find out. The Egyptians weren't all that forthcoming about scandal in government. What is known is that Nefertiti played an unusually prominent role in reliefs of public monuments, temples, etc. from the time her husband, Akhenaten the heretic king, came to the throne. Most queens aren't shown so prominently as she was, but it may be that she played a powerful role in Akhenaten's "revolution", or he may have been totally "smitten" with her. Nefertiti may have been the daughter of Ay (Tutankhamun's chief advisor), and Ay may have been the brother of Akhenaten's mother, the powerful great royal wife of Amunhotep III). Whatever the case, Nefertiti does not seem to have been a royal princess, simply a highborn lady. Nefertiti is shown in thousands of reliefs and plays a prominent role in Akhenaten's iconography for years. She had six daughters, but evidently no sons. Then, in year twelve of Akhenaten's reign, she vanishes from all reliefs, monuments and correspondence. What happened to her? No one knows. She could have simply retired; she might have died. There is another alternative, for which you'll have to read my next book, the conclusion of the Nefertiti Trilogy -- Slayer of Gods. Lord Meren himself is a fascinating character. How did you create him? "I couldn't write a successful romance if I didn't enjoy it. Each type of book requires a great deal of expertise. Anyone who thinks writing a romance is easy has never tried to write one." inquiry agents called "The Eyes and Ears of Pharaoh". That piece of information stuck in my mind, and many years later when I was thinking of creating an ancient Egyptian mystery series, I used it. However, most people don't understand that personality and individual characteristics are not readily available from our data on ancient Egypt. The Egyptians don't seem to have written diaries, or at least we haven't discovered them yet. Their interest was in the unchanging, the ideal, the things that last forever. Thus, in their tombs we see pictures of an ideal life, and certainly no one would write bad things about himself in his tomb. So if you read something about what a particular pharaoh is like, or any ancient person, remember that it's probably 90% speculation on the part of the writer. Lord Meren isn't based on any historical figure. As for characterization -- that's based on what I know about the culture. I use what I know about ancient Egyptian values, ideals, laws and customs. For example, they valued respect for elders as did most preindustrial cultures. They valued honesty, intelligence and a certain kind of creativity. They had "commandments" against killing, cheating and stealing. I also use ancient Egyptian documents-letters, records, monumental inscriptions, etc. It's in their letters that one gets a glimpse of the individual. In addition, as an anthropologist I already knew that there are certain panhumanic traits that do not vary from culture to culture. (For example, all cultures have a social organization & kinship structure within which they raise new generations.) From all of the above I have learned that ancient people weren't very different from modern ones. Thus I use my own experience in characterization as well. As for Lord Meren himself, he's a composite of all of the above, and he's not based on a particular person. What's next on Lord Meren's agenda? Finally solving the Nefertiti mystery in Slayer of Gods. Then I'll go for a change of pace - away from the royal intrigue and the ancient international stage to another "country house mystery" setting as in Murder at the Feast of Rejoicing. Time for a change of pace. How accurate generally is the information portrayed about Ancient Egypt in current fiction? I'm not an Egyptologist. I'm a writer. I don't read much ancient Egyptian fiction, so I can't answer the question. However, as I mentioned previously, the ancient Egyptians weren't as interested in the idiosyncratic, the changeable and ephemeral, so much of what they left behind in their writings and reliefs deals with the harmonious, unchanging and everlasting aspects of life upon which they placed so much emphasis. It is rare for scholars to catch a glimpse of a single personality. Those persons who were in a position to change things sometimes left their mark, as with Akhenaten, but in general it is almost impossible to attribute individual characteristics to an ancient Egyptian the way we would about someone like Henry VIII of England, for example. Thus, whether you're reading something by a scholar or a fiction writer, be wary of claims that, for example, Ay was a secret plotter who murdered his way to the throne of Egypt. In my books, the only personality to which one can attribute some detail is Akhenaten. However, it is unlikely that we will ever really discover even his true motivations. What do you believe is the reason for the fascination with this historical time period? a. The fantastic cultural achievements -- among the first to invent a system of writing, the invention of paper (papyrus), the first monumental architecture, the first large-scale efficient government bureaucracy, etc. b. Preservation -- the dry climate and the use of stone for tombs and monuments has left an unparalleled archaeological record. c. The "culture of death" -- the practice of mummification fuels the imagination. However, because the Egyptians built their tombs in rock, there is a differential preservation factor that makes it seem as if they were obsessed with death. In reality this is a false impression due in part to the fact that ancient Egyptian houses and cities were built of mud brick--which collapses and decays -- while the stone tombs and monuments remain. So what we're left with is not representative of everyday life in ancient Egypt. If you notice in my books, the people in them don't spend most of their time in tombs and thinking about death. You can't build a rich and complex civilization if that's all you do. d. The multiplicity of gods in their religion and their fantastic appearance. What people don't realize is that these gods are far older than Egypt as a kingdom. They started out as local gods of tribal groups in separate settlements along the Nile. As the forces of state formation created the ancient Egyptian kingdom, the local gods went along for the ride. e. Unique and often beautiful art. How have your studies affected you as a fiction writer? look things up. Most of all, coming from anthropology means that I'm used to putting aside my own cultural prejudices and adopting the values and habits of alien groups. So when I write a historical novel, you can be sure my characters aren't going to behave as if they just stepped out of a living room in 20th century America (editors hate that). Thus I'm able to imbue my work with an authenticity not readily available to someone without my background. Also, since I have an academic background, my approach to writing reflects this. I work in an extremely organized fashion: #1. research; #2. data assessment; #3. organization & outline; #4. first draft. That method is second nature to me, and arises out of scholarly research methodology. But it's not for everyone. Some of the most successful writers "ad hoc" their way through many drafts before they become organized, and then they produce a wonderful novel. However, I can't imagine writing a mystery without knowing first the specifics of the crime. In addition to the Lord Meren mysteries, you are also a successful romance novelist under the name of Suzanne Robinson. How did you get your start as a historical romance novelist? ancient Egypt doesn't sell. But I knew one genre that did sell -- romance. So I set a romance in ancient Egypt, and Bantam bought it. Being a novice writer, I hadn't thought much beyond my first sale, but of course Bantam wanted another romance, one set in another time period. I had read extensively in the Tudor period, and I decided to write my next historical romance in that setting (Lady Gallant). Well, the books took off, and one contract led to the next, and so on. So writing romances was at first my way of writing about ancient Egypt. There's something else that may surprise those who don't know much about the romance genre. I learned to write mysteries by writing romances. All my historical romances are, at their center, novels of mystery or political intrigue. The Tudor ones pivot around the political and religious turmoil of the Reformation in England-Catholics versus Protestants, Bloody Mary against her sister Elizabeth Tudor (Lady Gallant, Lady Defiant, Lady Valiant). The Victorian and medieval novels are murder mysteries (The Engagement, The Rescue, The Treasure, Lord Of The Dragon). Of course, the emphasis is more on relationships whereas in a mystery the emphasis changes to plot. In the romances I get to write about strong women who carry the action and plot, whose actions and feelings are as legitimate and important as any man's. It's cathartic for me. Which genre do you prefer writing in and why? I suppose here I'm supposed to say, "Mysteries, of course!" Sorry. I like both. I couldn't write a successful romance if I didn't enjoy it. Each type of book requires a great deal of expertise. Anyone who thinks writing a romance is easy has never tried to write one. I'd like to talk about your latest romance novel: The Rescue. The Rescue is set in Victorian England and starts Miss Primrose Victoria Dane and the handsome scoundrel, Nightshade. What was your inspiration for the story? The slums and rookeries of mid Victorian London and the Victorian underworld. What is your next romance project? A story set in the medieval period. I'm interested in what would happen to someone who had the paranormal ability to glimpse the past in limited "visions". How would such a person survive in a medieval culture where the risk of being accused of sorcery would be very real? Plus, I recently met someone who is going to serve as a partial model for one of the characters in the story. I'd like to talk a little about the writing process itself. What's your typical writing day like? "I need to know something about the major components of a culture before I begin to write about it...such...as: technology, social organization, values, language, religion, art, and everyday life. I'm just as interested in what they ate for dinner and where they went to the bathroom as I am in great art and literature. I like to say I become a fictional anthropologist when I write." because I live in Texas. I write during the heat of the day (July and August can have many weeks of 100 degree days). I don't set a certain number of hours. I write until the movie in my head finishes or until I run out of time. A typical day begins with a walk in the park with my two English springer spaniels (and a tiny new foundling Terrier mix). This is where I get some of my best characterization and plotting done. Then it's back home to tackle the business side of writing followed by lunch. Then comes the sacred time, the first draft phase of a writer's job. Anyone who interrupts me then risks all. I work on a computer when I'm ready to do a first draft, but I take research notes by hand. Because of the way I work, which is extremely organized from the first, I don't do a lot of rewrites. Also, I write summaries (outlines) by which I obtain contracts for books, so a lot of the work is already done before I start the first draft. I'll usually do one revision after I finish the first draft. However, you have to remember that I've written 16 books. As one gains experience, one naturally has to do less rewriting than one had to do as a novice. You write in the Victorian, Ancient Egyptian, the Medieval and the Elizabethan time periods. You must truly love research! How do you approach your research projects? Do you have a special method? By now my methods are second nature to me. However, as an anthropologist I feel that I need to know something about the major components of a culture before I begin to write about it. Those components include such areas as: technology, social organization, values, language, religion, art, and everyday life. I'm just as interested in what they ate for dinner and where they went to the bathroom as I am in great art and literature. I like to say I become a fictional anthropologist when I write. Do you use the Internet for research? Do you use the Web for anything else? The World Wide Web is light years wide but not very deep, so it's not good for detailed research. It's useful for finding references and experts. It's useful for ordering books and for communication via email and website (marketing). I view the Internet as I do the computer: it's a useful tool, but there's nothing magical or mysterious about it. In the future this lack of depth should change, and I'm sure one will be able to find whole scholarly books online. That will be great. I understand you are leading a tour to Egypt yourself. Tell us about the tour. Is it for mystery lovers or amateur Egyptologists or both? The Lord Meren tour of Egypt is for both mystery lovers and the casual tourist who simply wants to see the sites. I will serve as a kind of literary study guide and talk about my books in relation to the things we see in several talks throughout the tour. However, all official guides of tours are Egyptian citizens, so when we go to a site, the Pyramids, for example, there will be an expert to tell us all about them. We will be seeing all the major sites of Egypt: the pyramids of Giza, Valley of the Kings, Karnak and Luxor (Thebes), and much more. Plus, there's an extension of the tour for those who want to see Akhenaten's capitol of Amarna (Horizon of Aten). What is your advice to the aspiring mystery novelist? You can never read enough about how to write. Good writing is good writing, no matter what genre or type you're dealing with. In other words, you should master point of view, characterization, tight plotting, etc., whether you're writing mystery, romance, science fiction, or a literary novel (literary aspirations are no excuse for bad writing). You don't have to be an English major to be a writer, nor do you have to be a Ph.D. The biggest difference between being published and unpublished (besides talent) is sheer bloody-minded determination. Never give up! What do you like to read for recreation? Not historical fiction. I write so much about the past that I like a break from it. I read a little bit of almost everything. I read the New York Times, contemporary mysteries, some thrillers, and the fantasy novels of Terry Pratchett. I like P.G. Wodehouse, articles on science, biographies, and a little (but not much) horror (some Ann Rice and Stephen King). My most favorite leisure reading, however, consists of Egyptology or things like everyday life in medieval, Tudor or Victorian times. Right now I'm reading a book on Mycenaean Greece (pre-classical Greece contemporaneous with the reign of Tutankhamun). If you had to live in another time period other than our own, which one would you pick and why? I wouldn't want to live in a past time period. Think about it -- No antibiotics, no concept of sanitation, no TV, phones, radio, computers, no pain killers for women in labor, no abdominal surgery, no air conditioning! Even Victorian England was primitive when it came to sanitation until the latter part of the 19th century, and think about having a tooth pulled before modern pain killers. However, I wouldn't mind visiting ancient Egypt as long as I could get back. Why? Because of their great achievements and because despite their cultural differences, they seem to have shared so many of our values-they liked order and responsibility, they loved children and having a good time. And if I went back there, I could finally find out once and for all exactly how those pyramids, temples and obelisks were constructed and what really happened to Nefertiti! 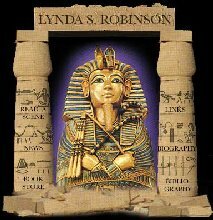 For more information on the tour Lynda is leading to Egypt from February 21 through March 7, 1999, visit the Museum Tours website. 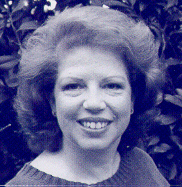 Photo of Lynda Robinson Copyright © 1998 by Wessley I. Robinson.